Metals and their corresponding ores are by far the largest thing that has been added into the game. "Metals" is an umbrella term used for any material that makes a tool like wood because most of those materials are metals. 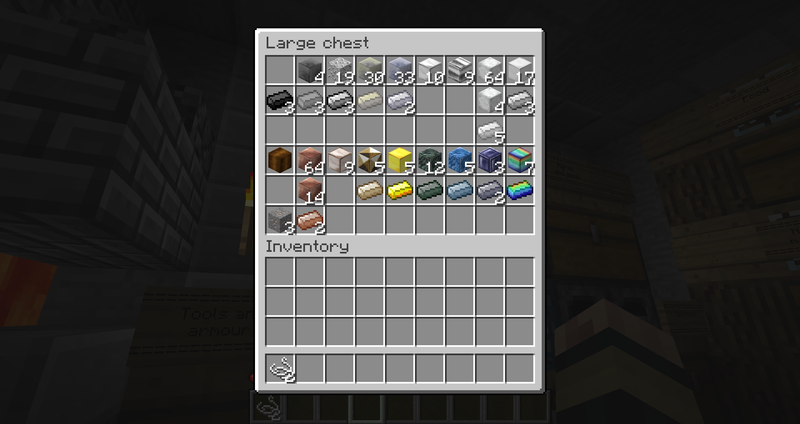 Vanilla Minecraft has always had a linear four tier progression: Wood -> Stone -> Iron -> Diamond. In New Frontier Craft, there are six tiers with multiple metals in each. Just like in vanilla where you cannot mine Iron ore with a wooden pickaxe, in New Frontier Craft you cannot mine a tier three ore with a tier one pickaxe. Below is a list of the metals and their stats for pickaxes. To give you an idea of how these compare to vanilla values, vanilla Diamond has a durability of 1561 and speed of 8. The same stats apply to shovels and axes. Swords and Hoes get their stats from the tier the metal is at, so all hoes/swords are uniform at a tier. Armor is also uniform per tier. Obsidian is mined by tier 4+, redstone is mined by tier 3+, and coal and lapis are mined by any tier. It is possible to skip tiers through alloys like Steel, Brass, and Bronze. This is done by getting the metals needed to make an alloy like Brass, so Zinc and Copper, with something like a Wood pickaxe, allowing you to skip tier one. Unless you strike lucky and get the materials to jump a tier, I don't recommend holding out on lower tier metals just so then you can jump a tier. Swords and armor will have a large change in the combat update.